Paige Hill: Super Easy Fabric Pumpkins! It's common knowledge that I am a BIG fan of Halloween. I especially love decorating my house and creating projects ... It's my favorite time of year:) One year for Bunco I decided to make fabric pumpkins for all of our players. I had made a bunch before for a craft show, but I couldn't find the pattern. Luckily I found one that was very similar HERE on About.com. I the directions they use up until the "sculpting" part. 1. Leave a wider opening at the top. This gives you room to add the wire for the tendrils. 3. Before you add the stem, add one or two lengths of wire by pushing them down through open hole. 4. Add the stem and trim using hot glue. MUCH easier and sturdier than sewing! 5. 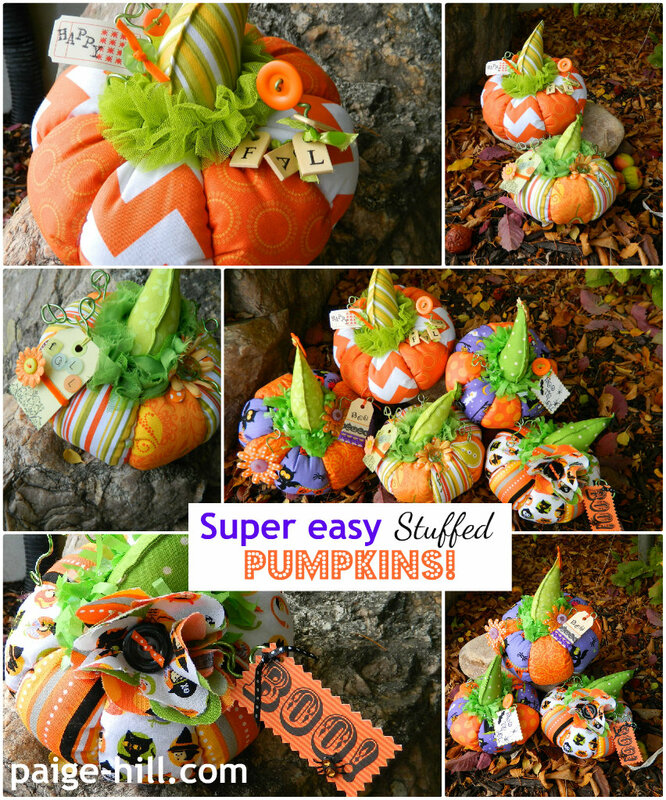 Add some fun Halloween and/or fall embellishments you choose including: Buttons, stamped tags, ribbons, flowers, spiders, bats, pumpkins ... The more the better! If you have any questions, I'm happy to help:). 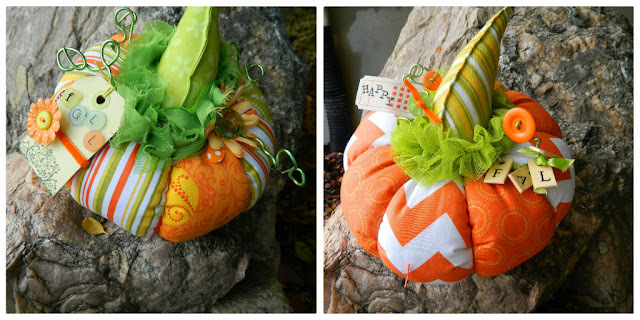 The fabric flower on the little Halloween pumpkin was made with an AccuQuilt GO!baby. Those pumpkins are adorable! Love the chevron fabric. I'm sure you'll come up with something amazing for La La Loopsie! Adorable pumpkins! Love the gorgeous fabric!